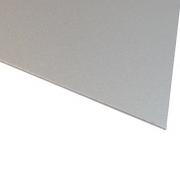 Aluply is a surface finished anodised aluminium, available in a 0.5mm and 1mm thickness. But do not let the thickness put you off. This material is highly suited to outdoor use. This highly versatile product is best cut with a guillotine or punching tool. For best effect use on a laser machine, to produce a permanent black mark without the need for laser marking spray. In our opinion this is an excellent product.